Weatherproof and even self-charging, the Tertill lives in your veggie- or flower garden and takes care of the weeds that pops up the garden for you. With Tertill, gardeners can now enjoy a weed-free vegetable and flower garden, without the monotony and frustration of getting id of the weeds yourself. Organic gardeners can breathe easy and enjoy a weed-free, chemical-free garden all season long. 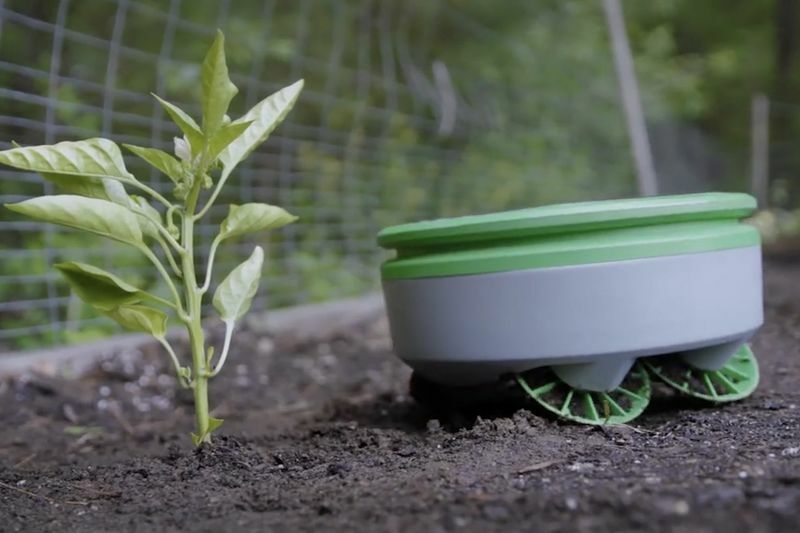 Created and designed by roboticist, Joe Jones – inventor of the Roomba – Franklin Robotic's Tertill robot is designed to live in your garden and take care of those unnecessary weeds that grows, come rain or shine. Tertill has a very simple method: weeds are short, and plants are tall. A plant that are tall enough to touch the front of Tertill's shell activates a sensor that makes the robot turn away, and seek for smaller plants. If a plant is short enough to pass under Tertill’s shell, the robot activates a different sensor that turns on the weed cutter. Tertill whacks the weeds using a spinning string trimmer, which cuts the weed off near the ground. Because Tertill lives in your garden and goes looking for weeds every day, the weeds are always small when the robot finds them, and there is no time for the alien-plants to take over your garden. Tertill never lets a weed develop the leaves so eventually the weed gives up and dies. Tertill gets its power from the sun. When there is sunlight – even on a cloudy day – Tertill’s solar cell converts this light into electricity, for the robot to roam free. The robot stores the energy in a battery that doesn't need charging or replacing. Tertill uses its stored power smartly – during cloudy stretches, when less power is available, it patrols for weeds less often. Tertill is more aggressive during periods with more sun. Fortunately, weeds grow more slowly when they have less light. You can see how Tertill works by watching the video below.